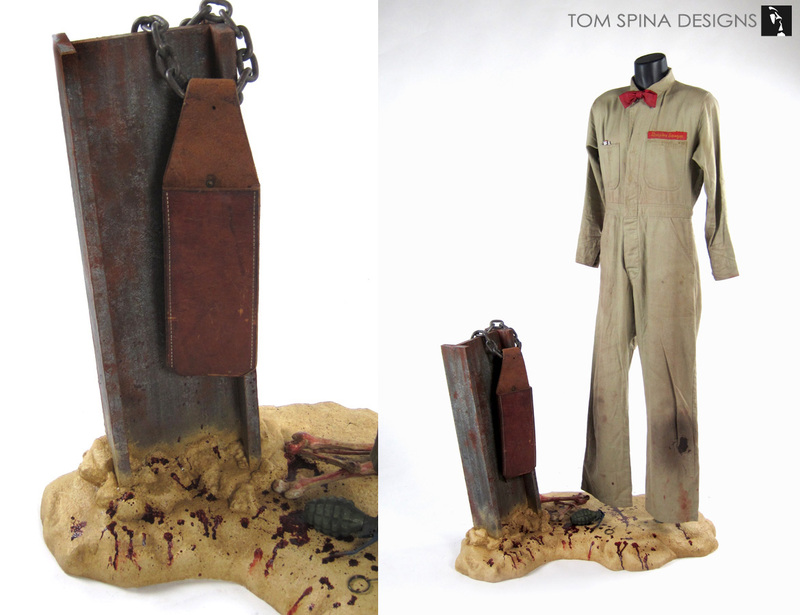 The buzz is back with this custom display and themed base for an original Texas Chainsaw Massacre 2 prop and costume. 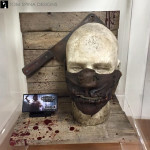 Our client had a Texas Chainsaw Massacre 2 prop and movie costume that they wanted showcase together in one themed display. They had one of the screen used prop holsters used by Dennis Hopper’s character “Lefty” to carry his chainsaw. 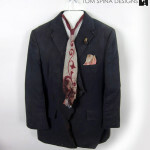 Our client also had also had the screen used costume for Drayton Sawyer also known as ”The Cook”, played by Jim Siedow. The original movie costume even features the large blood stain from the end of the film when Lefty attacks him from behind with a chainsaw. 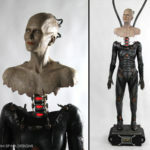 Our client was looking for a way to feature both pieces in one display that looked cohesive and stayed true to the macabre style of the film.We started by creating the custom mannequin for the Cook’s costume. Since his coveralls were pretty sturdy on their own we decide that going with a custom torso mannequin would give the piece enough support while allowing the sleeves and pant legs to hang freely. Using a male torso mannequin also helped to keep the budget in check for this horror movie costume display. The challenging part was incorporating the holster from Lefty’s character into a single display. What we came up with was a custom faux rusted steel I beam for the holster to hang on. This gave the two pieces separation based on the characters they belonged to but kept everything looking cohesive. For the base we decided to go with a faux sand for the ground scattered with bones and covered in blood splatter, because these are Texas Chainsaw Massacre props. 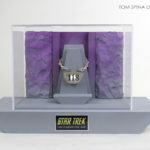 We also added an inert, faux grenade prop as a nod to Drayton’s decision at the end of the movie. 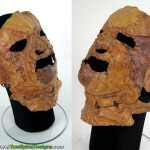 Love the Texas Chainsaw Massacre movies?